My dear friend and incredible baker, Lisa, gave me this idea recently and I thought it was so very clever! When I served this cake, smiles were on every face and all the kids proclaimed that they wanted their name in chocolate on their next birthday cake. Chocolate numbers would be fun, too. White Chocolate would be very pretty on many cakes and could be colored with food dye to coordinate with any color scheme. You could also use colored sprinkles. 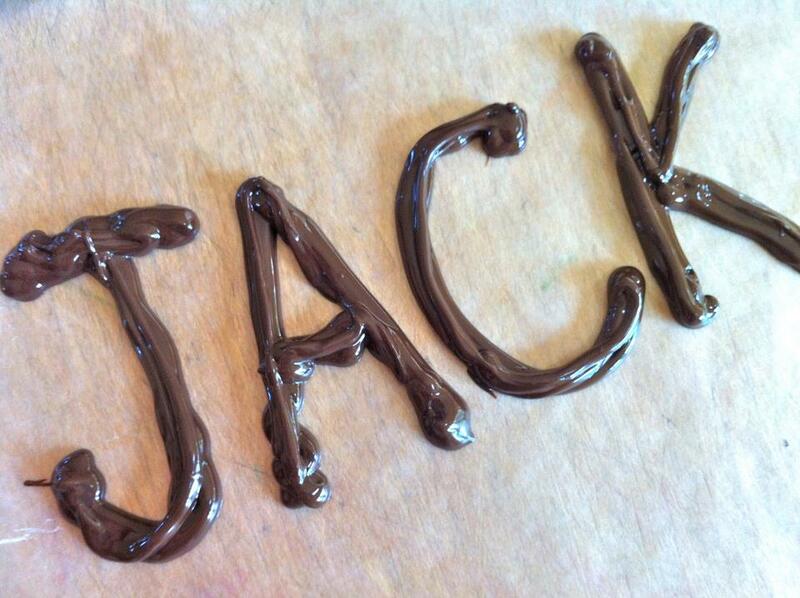 Just make sure to sprinkle on the letters before the chocolate hardens! Lay a piece of wax or parchment paper on a large cutting board or counter. Heat chocolate in the microwave in 30-second increments until completely melted. Pour into a zip-top bag. Let the chocolate sit for a few minutes to thicken or place in the refrigerator for a minute. You don’t want it to be too runny. Snip a small piece off one of the bag’s bottom corners. You can always cut the hole bigger, so start small. Pipe chocolate in the shape of any letters or numbers you desire. I re-piped over the letters a couple of times to make them thick enough that they wouldn’t break too easily. Let harden on the counter or in the refrigerator. I put mine in the fridge for a few minutes before placing on the cake so the chocolate was not at all soft. They were easier to stick in the cake this way. Keep in mind, candles burning too near the letters will cause them to melt. Just keep a little distance and you should be fine! We think this is the perfect chocolate cake and the letters looks great on top! 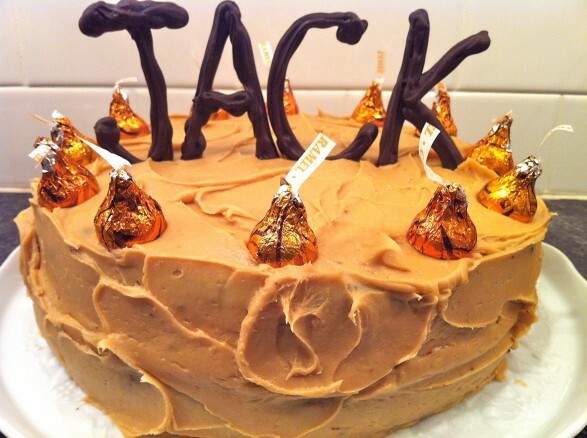 Click HERE for the recipe for Hershey’s Cocoa Cake and HERE for the homemade caramel frosting. this is absolutely awesome…totally doing this for the next birthdays! They are really fun, Laura. Hope the kids enjoy! Hi Gretchen, I love the idea of adding gold dust and other decorations made from icing. How festive and beautiful that will be!